Chris Ellington holds an Economics degree from Auburn University and has achieved the designations as a Certified Financial Planner, Chartered Life Underwriter, Chartered Financial Consultant, and Retirement Income Certified Professional. Chris also holds security licenses for Series 6, 63, 65 and Series 7. Since 1985, Chris has been in the financial services industry and is the founder and President of WealthCreation Atlanta, LLC. (WCA). 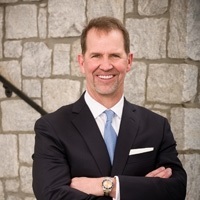 He serves as Vice President of Peachtree Planning. WCA is a financial consulting firm in Roswell, Georgia with an expertise in all financial aspects of the business owner’s life, both personally and professionally. It is common to uncover thousands of dollars a month that are being transferred away unknowingly and unnecessarily. Creating financial efficiency allows the business owner to make sound investments…like maximizing your business! Understanding the life cycle of your business is critical in order to maximize financial opportunities. Chris is a member of Dental Resource Partners (DRP) and is an active supporter of the Georgia Dental Association, the Georgia Society of Oral and Maxillofacial Surgeons, and Dental Office Managers Association (DOMA). Chris is an Atlanta native, father of 3, a 14-time Ironman triathlete finisher, and in his free time enjoys Destin, Gulf Shores, and boating on Lake Lanier.